Hi, I'm I’m Debbie Blanchard. I’m a product owner in DWP Digital, based in Blackpool. 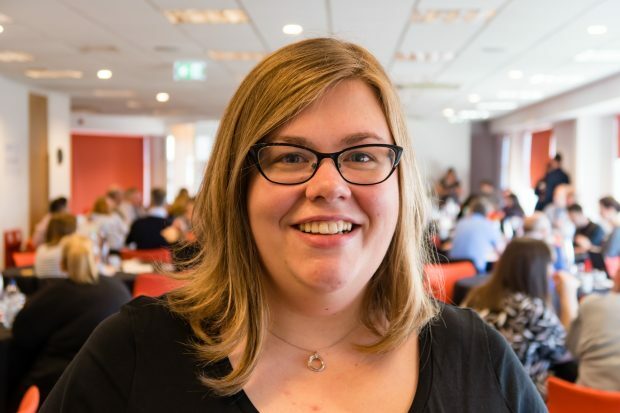 I am passionate about communities, and have found our product owner profession and Product Design practice communities really valuable in giving me a sense of being part of a wider whole. One of my personal challenges this year has been to try and build my community outside DWP. I’m involved in the One Team Government community (keep an eye out for our event in the North soon! ), and recently attended my first unconference at UK Govcamp. UKGovcamp is the free, annual ‘unconference’ for people interested in how the public sector does digital stuff. It’s held on a Saturday in January, and this year was at the Ministry of Justice. Govcamps are free to attend, focused on attendee participation, and are ‘relentlessly positive, constructive and creative’. It sounded right up my street, so I applied for the ticket ballot. About 600 people entered the ballot for tickets, and 250 were picked at random to attend. I was one of the lucky ones! I got really nervous before going, wondering whether I would have anything useful to contribute, and have the courage to talk to anyone. I needn’t have worried. Govcamp was one of the most open and friendly events that I’ve ever been to. The event was positive and inclusive, and there was a clear commitment that every voice should be heard. I felt that the 'Campmakers' had worked hard to create an environment that was supportive for everyone – there was a quiet zone for people who just needed some space, and people very politely put up their hands before speaking in group sessions, allowing everyone to be heard. Sounds great, right? But what is it all about? The day starts with pitching. In true unconference style, you can get up and suggest a topic to talk about. This doesn’t have to be something you want to lead - as long as you have a suggestion and people are interested in it, you’ve got yourself a session. I was amazed at the number and variety of the pitches, and there were so many sessions that I wanted to go to! After the pitches, the session grid is finalised, then it’s all go. You pick the session you’re interested in and go along. If you don’t like it, you leave and find something else. Or you can miss a session to have some quiet time/grab a brew/have your own impromptu chat – your conference, your rules. My first session was “Health Nerds Unite!” I‘m leading some work to look at whether carers have the right information to help them make informed decisions, so I thought I might make some useful contacts at this session. This session really opened my eyes to the complexity of the healthcare system that carers need to navigate, often at a difficult time in their lives. There’s health care (doctors, consultants) and social care (local authorities), and there isn’t any common offer, it varies according to where you live. There’s been some good work done on this, and I have some excellent contacts to follow up on. My second session was #NotJustLondon. This resonates with me as a true northerner, but there was a massive geographic spread of attendees (which did slightly expose my lack of geography skills, but never mind!!). We talked about how we can create/build on networks outside London so that opportunities aren’t being missed, and about how there are tools to use to facilitate remote working. Accepting that the Agile manifesto suggests everyone should be in the same room, should we challenge whether that can now be a virtual team room? It’s an interesting question, and one that I think will become more important in the future. We did talk about if one is working remote, all should work as remote, so that no-one is left out, and that’s something I think we should all takeaway. After lunch, I went to a Weeknotes meetup. I show my commitment to working in the open by publishing weeknotes on Medium (although do admit they are not always weekly), as do a group of other very disparate people from across the country. This session gave us an opportunity to actually meet in real life, and to talk to prospective weeknoters about why we do it, and what it gives us. In true ‘Team Weeknotes’ style we’re writing a joint blog about the session. My final session of the day was ‘GDPR is not a 4 letter word’. It struck me that an awful lot of people have just vaguely heard of General Data Protection Regulation (GDPR) and don’t really seem prepared. I’ll just leave that there, but suffice to say that I’m glad for the work that’s been done in DWP and the support that’s available. 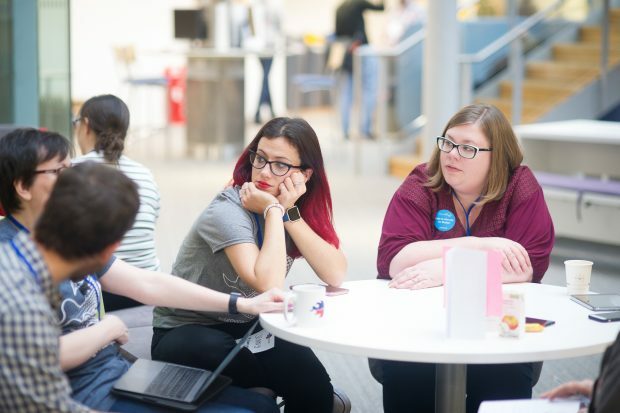 What did I learn at UKGovcamp? So, what did I learn? I learned that I have an unhealthy need to pick up free stickers from sponsors’ stalls. I learned that I am proud to be part of a community of disrupters who are passionate about making change. I learned that starting a conversation is sometimes the most valuable thing, as you can find someone who might be able to help. And I learned that I most definitely want to go back to Govcamp. Maybe I’ll see you there?